Hello Stampers! I made another card for the Coffee Lover's Blog Hop using this image from Stamploration called Coffee For Fall. My cup is filled with hot cocoa hence the brown inside the mug. I created the background using Distress Oxides to watercolor and added splatters of Spiced Marmalade. I colored the image using Copic markers and to break up some of the Fall colors I added a purple to create contrast. I used a white gel pen to add dots to the cover of the mug. I LOVE your use of color! Such a fun card! Happy creation in pretty colors, love it! This is a perfect Autumn card. Fabulous! Love your background on this one and your coloring of the image is awesome! Fabulous card with all the vibrant fall colors!! Fabulous colouring and details on this card! That purple is so pretty and purfect. Love the bright, happy colors. Awesome card! Beautiful! 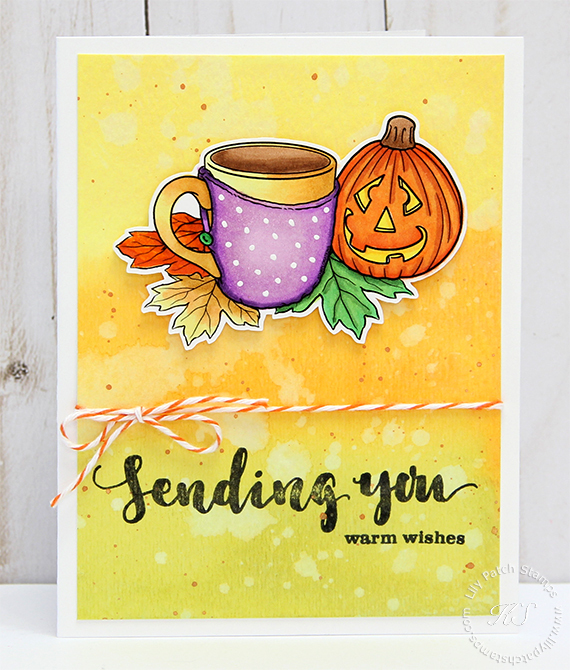 That background reminds me of candy corn and you've colored that freebie beautifully! This is soooo pretty! LOVE that purple cup cozy!!!! Wow, love your coloring and background. this card is so nice! Great take on coloring this image. That is so cool!